Note: This is a grade-level appropriate biographical essay about a significant figure from Wisconsin's past and was originally part of the "Essays for the Elementary Student" series. You have a good job. You graduated from college. You are looking for your first apartment on your own. It's exciting. But when you meet the landlord, they turn you away because of the color of your skin. What do you do? Would you let racists tell you where and how to live? Or would you fight for change like Vel Phillips did? Vel Phillips’ life has been a series of firsts. She was the first African American woman to graduate from the University of Wisconsin–Madison law school. She was the first to win a seat on Milwaukee’s City Council. She was the first to become Secretary of State of Wisconsin. She was the first to become a judge. And she did it all at a time when many African Americans were not allowed to exercise their civil rights. Velvalea Rodgers was born in Milwaukee on February 18, 1924. She went to North Division High School in 1942. Vel was such a great student that she won a scholarship to attend college. She graduated from Howard University in 1946. In 1947, she met and married fellow student Dale Phillips. Together they went on to law school. Vel graduated from the University of Wisconsin–Madison Law School in 1951. She was the first African American woman to do so. She and her husband moved to Milwaukee and together they raised a family. Vel decided she would try to make people’s lives better by running for elected office. She ran for a seat on the school board. She was the first black woman to win a primary. She lost that election, but she didn’t quit. Vel wanted more African Americans to exercise their civil rights. She joined the NAACP. In 1956, Vel won a seat on the Milwaukee City Council. Vel became "Madam Alderman" and went to work for the people of her district. The heart of Vel’s district was known as the Inner Core. The Inner Core was run-down. Homes were falling apart. Schools were in bad shape. There were few jobs. White landlords would not rent to black people outside of the Inner Core. Black families could not buy homes in other parts of the city. The leaders of Milwaukee refused to pay for repairs to the roads and schools in the Inner Core. Something had to be done. 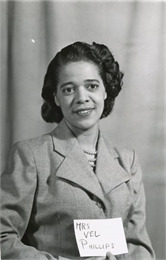 Vel proposed her Fair Housing Law in 1962. The law would make it illegal not to rent to black people. But it was voted down again and again. This went on for six long years. Vel participated in nonviolent protests against discrimination. She knew it wasn’t fair to tell people where they could and could not live, work and go to school because of the color of their skin. Riots broke out in Milwaukee in 1967. Four people were killed. Vel was arrested at a rally. People started paying more attention to the problems in the Inner Core. 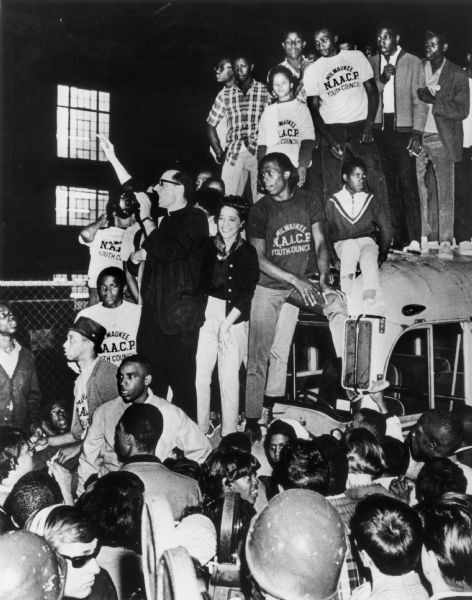 Vel began marching with Father James Groppi. They led people on 200 nights of marching. Night after night, they headed out from the Inner Core and across the 16th Street Bridge. Every night their march ended in South Milwaukee. Angry white men and women lined the streets. They swore at the marchers and threw rocks and bottles at them. Finally, in 1968, the Fair Housing Law that Vel had written six years earlier passed the city council. Vel didn’t stop there. 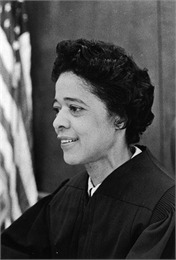 She was the first African American woman to become a judge in Wisconsin. In 1978, Phillips made national history as the first African American woman elected secretary of state in Wisconsin. Vel is still doing great things. She is writing a memoir of the Milwaukee civil rights movement. She helps other people get elected. The Vel Phillips Foundation works to help people achieve their dreams. Vel is part of the Wisconsin story that is still being written. See articles, essays, photos and more. Read a historical essay about Father James Groppi.